I have been doing a lot of thinking about integrating technology into the classroom and how important it is to ensure that it is authentic and purposeful. When thinking of the constructivist theory, technology can greatly impact students learning and can transform learning when used in the proper way. The SAMR model describes how technology can enhance or transform teaching and learning based on its integration. The two lowest levels of the model are substitution and augmentation. When in the lowest levels of the model, you are enhancing learning. When using substitution, technology is merely a substitute and has no functional change on the outcome. Augmentation enhances learning and teaching through using tools to perform tasks. The two highest level of the model, include modification and redefinition. In these two levels, you are transforming teaching and learning and in essence, there is a functional change in the classroom. Students may be asked to create a documentary which will then be played in front of an authentic audience or work cooperatively to achieve a task which cannot be done without technology. Dr. Tim Clark has created an excellent graphic showing the different between the two levels as digital vs. digitized learning. 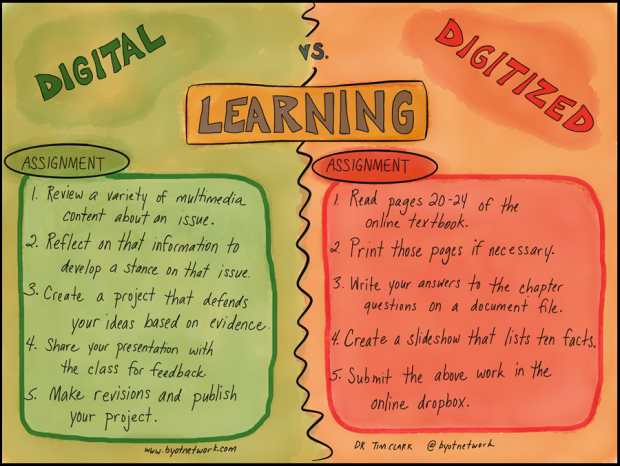 Although I try to use “digital assignments” the majority of the time when I am integrating technology, sometimes there is a need for a “digitized assignment”. Sun Associates (2013) describes technology integration best practice as “matching the most effective tool with the most effective pedagogy to achieve the learning goals of a particular lesson.” This is extremely important when integrating technology in the classroom. It is important to actively think of the instructional theories and pedagogy first, then select technology as a tool to enhance learning. 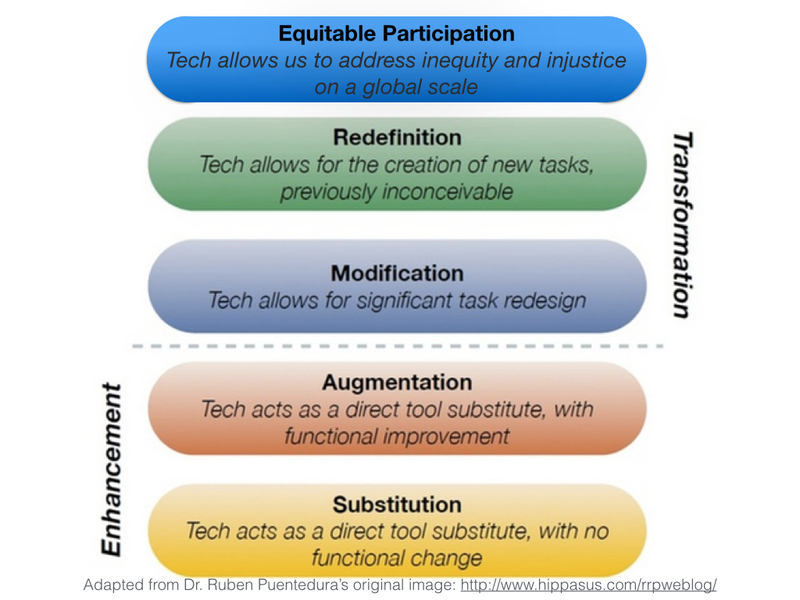 SIDE NOTE: As I was searching for images on the SAMR model, I came across the image below, which added a category of equitable participation. I was very excited when I found this image because I think the idea of including social justice through technology is a big part of teaching digital citizenship and media literacy… I have talked about this in a few of my previous posts. EC&I832 has reminded me of the importance of sourcing images and when I went to source this image, I was surprised it was created by none other than the Katia Hildebrandt! Integrating technology effectively and efficiently into the classroom allows you to teach to the 21st century learner. When thinking of teaching to the 21st century learner and integrating technology, it is about facilitating multiple literacies, cultural competence, communication, collaboration, critical thinking, and innovated thinkers. A final thought… even if you are new to using technology in the classroom, start with the lower levels of integration and build up your comfort zone, you are still enhancing teaching and learning, then take baby steps to use technology to transform teaching and learning. But more importantly, keep strong pedagogy at the forefront. Great blog Kristina! I am a huge fan of the SAMR model and love Katia’s addition. I am often conflicted with how to get some teachers to move up the scale and away from “Type and Print” and their is my technology integration. I love coming in and showing new ways students can demonstrate their learning beyond essays and PowerPoint presentations. I think the SAMR model should be more visible in schools! This is one aspect of including technology that I feel is really important. To be honest, I don’t really think that digitized assignments or even the lower levels of SAMR should be counted when it comes to using technology. For the few students who do get benefit (I know a couple people who really need to type things rather than handwriting whenever possible), that’s great. And it is easier to read than handwriting. But that technology hasn’t changed anything, not really. A PowerPoint presentation usually doesn’t do much that a poster could unless it includes audio and video. Our world has changed and base level is no longer “I don’t use any technology at all.” I tend to start with the question of why someone wants to use technology. What will it do that you couldn’t do an easier way that has fewer chances of technical glitches or need for support? If it isn’t actually transforming things, making something new possible, then I want to know what the drawbacks are. Might sound funny from someone who works with online classes but I see a lot of the drawbacks. I deal with things that don’t function correctly, technical glitches, counselling instructors on issues of student support (students get very minimal support at U of R and no support for anything other than logging into UR Courses, UR Self-Serve, or maybe browser issues). I love technology but I’m really in favour of simplifying unless the technology will really add something. Creative and authentic assessments make me really happy. Or getting in guest speakers (or just static videos) of someone you would never otherwise hear from. But that’s also a post-secondary situation where there is less emphasis on needing to teach the students the basics. I agree with you about using technology to “add something” but at the same time I think digitized assignments are sometimes necessary. Would we hand write essays? Or mail letters rather than email? Or go to the dictionary or library every time we need more information? In my opinion, sometimes it is ok to just substitute or augment our assignments. At the same time this shouldn’t be our only use. Digital Dualism is old? Now we experience an Augmented Reality?